you've heard of it by now, no? 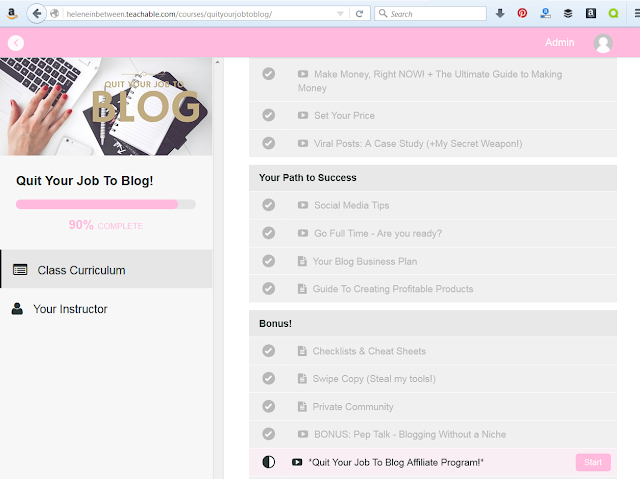 the online course from the blogging guru helene of helene in between. 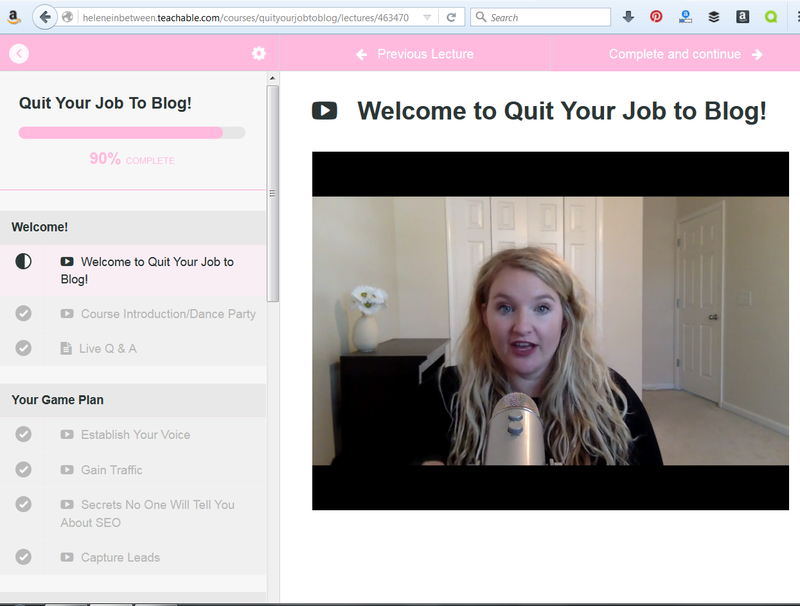 the e-course is titled 'Quit Your Job to Blog,' which is of course catchy but maybe (a) not true and (b) not for everyone. those were absolutely my first thoughts so i wanted to review it from the standpoint of a semi-skeptic as well as someone who's been blogging for awhile and has already had months where they've made around $1,000 from blogging. (and i don't even sell any products.) not quit my job level by any means, but also not newbie level either. could i benefit from the course or is it all basics? the other thought i had was that i didn't want to quit my job. i don't love being a lawyer every day but i also don't hate it and i know that under no circumstances do i have the self-discipline to work from home. home = hawkeye play time, all day e'ry day. work from home self-employment is simply not in my wheelhouse, and i can admit that. so would i benefit from this course as someone who doesn't want to spend all my days blogging and taking pictures? i substantially limit my online blogging time, especially compared to someone like helene who does this for a living, and i'm really not looking to increase the amount of time i spend. - about the instructor: helene is a really great speaker. sometimes i just do not like a person's voice or find it hard to follow, but she has a very calm and easy to understand style. she also actually has a background in this topic, which i like. sometimes bloggers just got lucky or don't have info that applies to a wide range of blog topics. at least helene has a degree in this and has worked many years in this area, for other clients besides just her own blog. i want to learn from someone with a wide variety of knowledge to share. - about the set up: it's set up on a website (teachable.) it tracks where you are in the class, as you can see from my screen shot, so you can leave and come back (even mid video). perfect for watching at your own pace. it flows really nicely from one section to the next. the steps actually make sense, which is good for newbies but also good for vets to skip over stuff they already know. you can re-watch any thing, any time. and you get life access, it's not like it's limited. not like that course on instagram i took that i couldn't see any more after like a week. - about the content: it is not just what you'd find other places. some of it is, for sure. you could search for some things on pinterest and get the answer. but here, it's all in one place plus a great amount of the content is not intuitive or available elsewhere (personally, i've never found something that tells you specifically what you should charge based on views, twitter followers, etc.) i think this is because the premise is that you don't need thousands of page views or a niche fashion blog to make money, which is different from the other schools of thought out there on successful blogging. oh and the downloads! so many good downloads. she shares everything she uses so you can just copy and use it too. like wording for e-mails to sponsors, lists of all her most helpful tools, business plan worksheets - it's a lot. honestly, a good chunk of the price is worth it just for those. - there are basics included in this class. to anyone who's had a blog a year or less, i think this will be a pro for you, but for me it's a con. i already knew the info. just my honest opinion! but i'm not sure that's totally fair, since i don't think you could have the class at all without putting in some basics, since every person watching will be at a different skill level. - you may have a little trouble on an older computer. it was easier for me to access everything at home on my mac. on my dinosaur work computer, i couldn't open the word documents. they're in .docx version, which is the newer version of word, when my computer generally only works with .doc versions. probably won't be an issue for anyone else but i thought i should mention it. but you can contact helene for versions you can work with, she's very good about that. - i don't think this is a con with the course but as someone really into finances and loving debt free life, you need to focus more on your income and needs/wants before you just quit your job. helene is passionate about blogging and she does offer a section on the financial aspect and knowing when you can start blogging full time, but seriously, you need to do more. that's bossy of me to say, but it's the truth. do not just walk in next week and say i quit and think you're going to instantly make 5 grand a month from blogging. that's not real life, and she doesn't tell you to do that anyway. but just in case. since this is a course on the blogging aspect, i think it does give you a good overview of the finances (what you can expect to make, how you can increase that number, etc etc) but i would go even further if you want to make that leap. finances are really important, have a good handle on it. get realistic about what you spend. get realistic about how much time you're going to put into your blog. use the blog business plan that's provided and then do more than what's recommended in the course. with all that said, there is something i want to note: there are more offerings than just this particular e-course if you follow helene and sign up for her newsletter, you'll get alerts when she releases something new. she offers free webinars regularly and just put up a free e-course on how to build a successful blog. this is a great way to get started if you're not sure you want to spend they money. you'll get an idea of helene's teaching style and info that she offers, so you'll be able to better decide if you want to go the full course mode. that was way longer than i anticipated. hopefully you made it this far and found at least something here helpful! if you have any particular questions, i can answer them for you. but i can still sum up the main reason you're here: do i think the course is something useful and something i think you should spend your money on? yes. ask for it for christmas, buy it here. i think it's info you can't find elsewhere, i think it's helpful downloads and worksheets, i think it's personalized advice and an instructor you can contact always, and i think it's a step by step guide to getting you more money. i don't know that i'd ever put in the time like helene does and do this blog thing full time, but even as a seasoned blogger i found a lot of things i could implement to help this blog make more money without putting in a ton more time. *she does offer an affiliate program. if someone buys through your link, you get a part of the profit. i did not use my affiliate link anywhere in this post. i wanted to share my thoughts without there being any sort of bias, or anyone thinking i just shared because i want to make money.